Natural gas gathering, marketing and administration present unique challenges that require insight and experience to maximize value. Making sense of the complex market options available for your commodity, Marabou works with you at each level to provide the services tailored to your specific needs. Gas gathering, purchasing, marketing, processing, transportation, storage, price management, administration and regulatory compliance are best managed when the approach to each is designed to work together with the rest. Working together with you, Marabou will define and implement the plan that best fits your requirements. The process is easy. We gather some simple information from you, review your contracts, develop your options and work with you to determine the best solution. 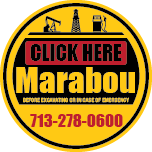 There is no charge for evaluation so you have nothing to lose by allowing Marabou to get you closer to market.